I know, you are all excited to delve into conformation photos and angle analyses. Me too! But before we do that, we need a frame of reference for understanding how we got where we are today, conformationally, and why that's important. Back in the days of horse-powered transportation and farming, soundness really mattered. Functional conformation is sound conformation when a horse is working for a living, and just like you wouldn't buy a car model that you knew was prone to engine failures, you wouldn't breed a to stallion that was prone to soundness problems when you were breeding your next car/tractor equivalent. I'm not saying there weren't unsound animals back then, but unsound animals were selected against on principle. Royal King was 14.3hh, compact, solid, good bone, and was slightly downhill with a nice hind end, allowing him to stay low, sit and chase a cow. Fast forward a few decades. 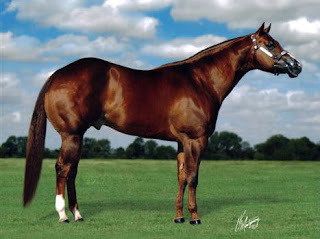 Taller Quarter Horses become very fashionable as different sports like Western Pleasure gain in popularity. People start selecting for taller Quarter Horses. But how do you add height to a historically short breed? You breed the angles out of them. If you were only looking at height - single-trait focused breeding - you breed for height and ignore everything else, so when a horse comes out slightly taller than his parents because his hind legs are straighter, it's a success. Then because a single stallion can influence a whole breed so heavily, that one trait can spread like wildfire if the judges decide they like it, and become magnified in the breed over time. The horse above wouldn't stay sound enough to do daily ranch work and wasn't bred for that! His breeder didn't intend for it - this is an important point. But he might be just what a Western Pleasure rider or halter handler is looking for. Pick any breed and you can see evidence of single-trait focused breeding based on show-ring influences - not in every breeder's herd, of course, but generally speaking. Thoroughbreds: speed at the age of 3, hang the soundness/foot quality. Welsh Cobs: big trot, hang the back conformation. Arabians: super dished face, hang the ability to breathe. Paint horses: color, hang the everything else. Breeding for color can get you in a lot of trouble if you're not careful. As you look at horses with the intention of learning more about conformation, keep those questions in the back of your mind: Why was this horse bred? What was he bred to do? What traits were desirable to his breeder? What show-ring forces might have influenced the breeding decision? Sometimes the answers to those questions are simple, and sometimes they are very complex, but they all have an effect on why a horse is formed the way he is - you can't look at the individual without also looking at the big picture. Great lens to look through! Nice explanation of the terrible legs we see in the QH world.